Peace Corps service is a life-changing experience, and no two Volunteers experience their service in exactly the same way. Check out some of the links below to learn more about the work of Peace Corps and the country of Botswana. 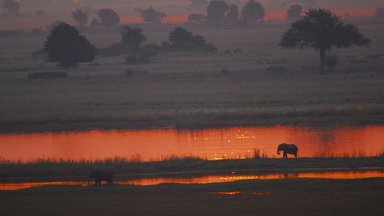 Elephants at sunset on the Okavango Delta, Botswana. Botswana Tourism Organization showcases the country's many natural wonders, diverse cultures, and provides information to travelers coming to Botswana. For the latest in news from the Government of Botswana and in-depth information about the public sector, visit their official website. Learn more about Botswana's approach to coordinating a national HIV/AIDS response through the National AIDS Coordinating Agency. Drink your morning coffee with the latest news from Botswana: Mmegi, The Voice, Daily News, Guardian, All Africa - Botswana. PCLive: Home to online resources representing the work and life of Peace Corps staff and Volunteers. Peace Corps Connect: The National Peace Corps Association (NPCA) is made up of returned Volunteers. You can find links to all the “Friends of” groups for most countries of service. Visit the homepage of the U.S. Embassy in Botswana with links to all U.S. agencies operating in Botswana, including PEPFAR, USAID, and CDC.